The surgeons of Northline Women's Health Center perform many types of procedures, such as daVinci robotic hysterectomies, using precise instruments inserted through tiny incisions that are no wider than a fingernail. This means surgery with substantially less pain, less blood loss and a much shorter recovery. Menopause care from Northline Womens Health Center in Michigan includes conventional treatment options, as well as guidance with herbal or alternative treatments. 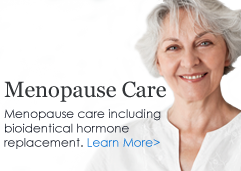 We offer traditional hormone treatment, as well as bio-identical hormone replacement therapy to replenish or replace hormones and ease your symptoms of menopause. From your first visit as a teenager to post-menopausal check-ups, the doctors and nurse-practitioners of Northline Women's Health Center are your partners to provide complete gynecological care for every phase of your life. You don't need to suffer in silence with a bladder problem. In most cases, urinary incontinence can be controlled, and often can be cured with treatments from Northline Women's Health Center. Pregnancy (prenatal) care from the obstetricians at Northline Women’s Health Center provides the best care for women in southeast Michigan. It includes regularly scheduled visits for physical examinations, testing, nutritional care and patient education, with emergency care available at any time. We provide the best in prenatal care as one of the few practices in Michigan that employs OB Coordinators who are registered nurses. Northline Women's Health Center has the finest team of medical professionals managing your care through every step of your pregnancy. Northline Women's Health Center offers you a wide range of options for family planning, from hormonal contraceptives such as birth control pills, shots and implants, to diaphragms, permanent sterilization surgery such as tubals and Essure procedures, and natural family planning. As your partners in good health, the doctors and nurse-practitioners of Northline Women's Health Center recommend that you schedule a visit at least once a year when we can evaluate you and perform tests, such as Pap smears and other regular women’s health examinations. If you have concerns about pain, lumps, discharge or other issues, Northline Women's Health Center performs breast exams and can refer you for ultrasound or mammogram testing, if necessary. And with monthly breast self-exam techniques that you'll learn from us, you can help to protect yourself. A 3D/4D ultrasound from the Northline Women's Health Center location in Dearborn provides an amazing “first look” at your baby, with all the detail, color, motion and excitement you expect from the latest in imaging technology and our skilled ultrasound staff.